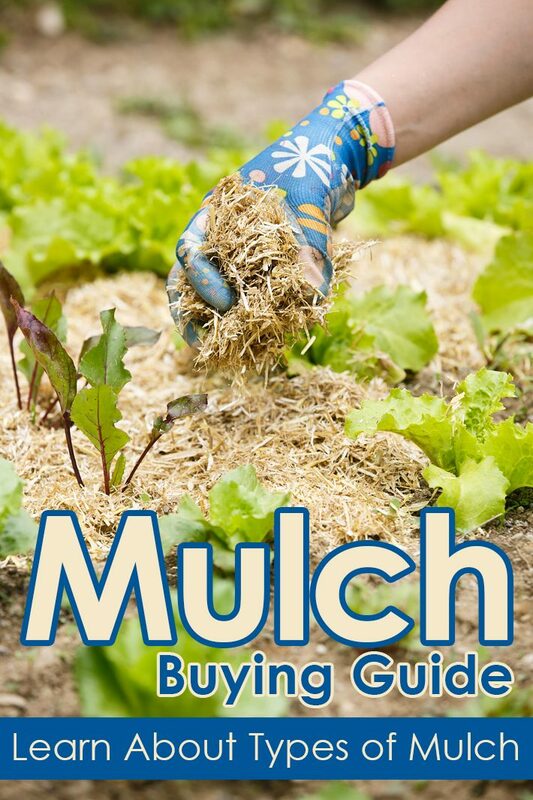 Mulch helps prevent weeds and retain moisture in your garden. Learn about different organic and inorganic types of mulch and how they can improve your landscape. Weed reduction — Mulch blocks the light some weed seeds need to germinate. It also impairs the growth of the weeds that do sprout. Moisture retention — Mulch reduces moisture loss from evaporation. Erosion control — Mulch helps hold the soil in place. Soil insulation — Mulch protects root systems from temperature extremes. 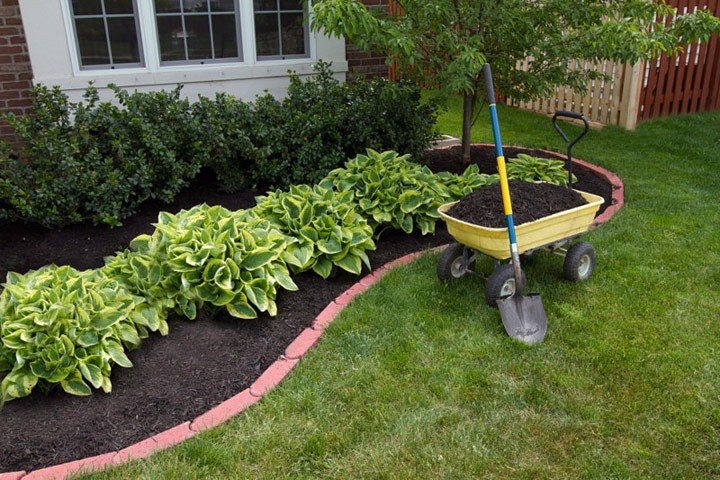 Beautification — Mulch ties together the appearance of different parts of your landscape. Too little mulch won’t be beneficial, but too much can harm your plants. The depth you need varies by the mulch type and how you use it. In general, a couple of inches of fine mulch can work well, but you may need 3 to 4 inches of coarser material. Some mulches break down over time — you need to apply more each year to keep them at the proper depth. 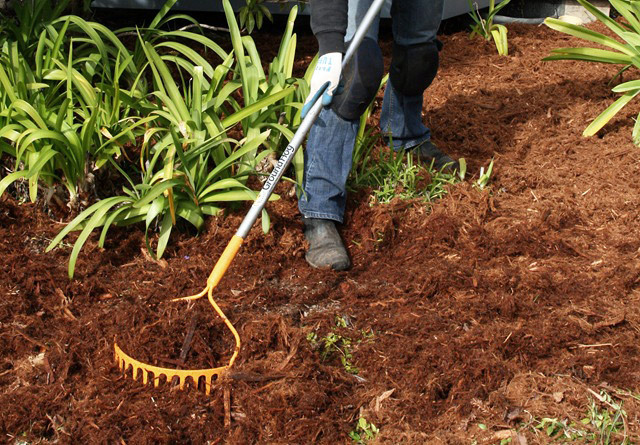 Tip: Don’t pile mulch directly against plants, shrubs or trees — pull it back an inch or two. Mulch that touches stems and trunks can cause rot and provide shelter from which pests can feed. Piling mulch too deeply also encourages root growth in the mulch rather than the ground, creating a root system that’s more vulnerable to cold and drought. Organic mulches come from natural sources. 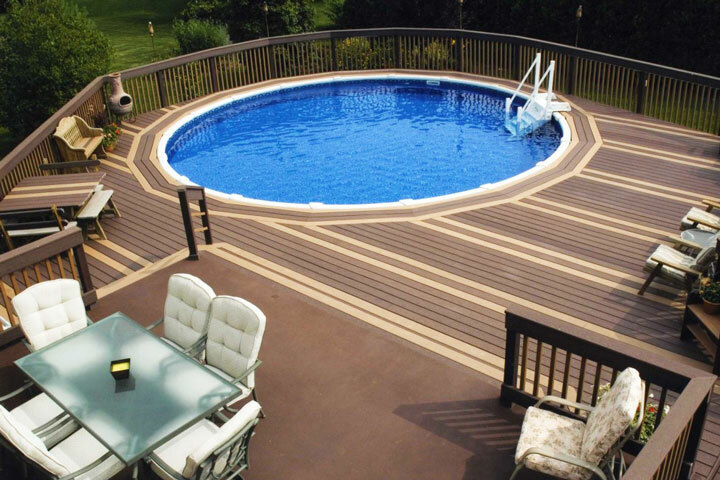 Some are byproducts of the lumber industry or recycled, biodegradable materials. In addition to the benefits listed above, organic mulches enrich the soil as they break down. However, as they decompose and settle, they need replenishment. Some organic mulches are regional — available only in certain geographic locations. Wood mulches are visually pleasing in texture and color. They decompose relatively slowly, so they’re long lasting, but the slow decomposition means they won’t add nutrients to the soil as readily as some other types. You can find wood mulch in a variety of colors, allowing you to coordinate it with your home and landscape. 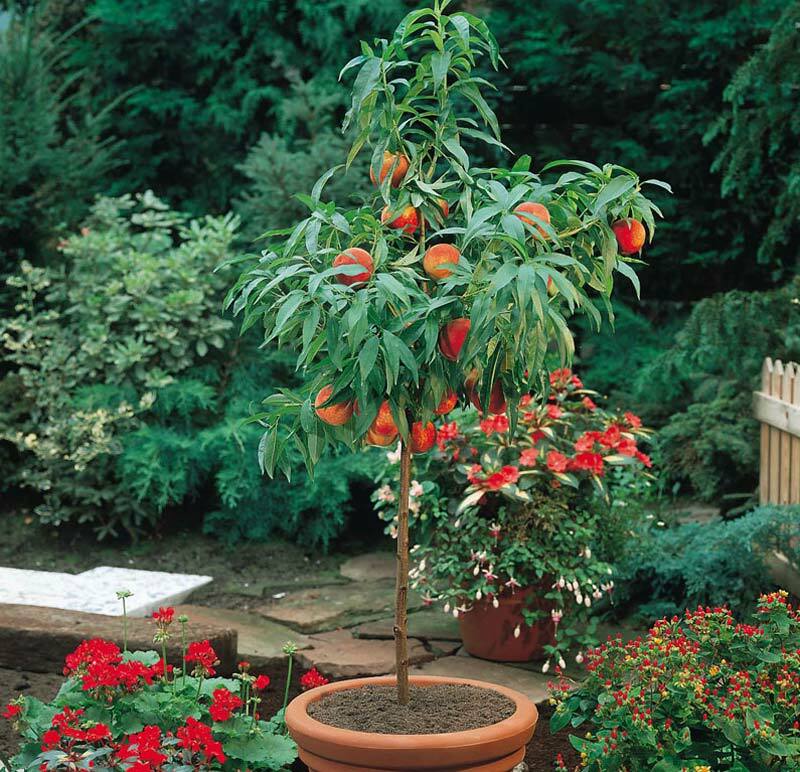 Use decomposed, seasoned material to reduce your plants’ exposure to toxins, acids and fungal contamination. Apply wood mulches yearly to ensure consistent coverage. Some wood mulches are made up of large pieces, which look better around trees and shrubs than in beds with small plants. Pine offers a long-lasting, dark color. Pine bark doesn’t compact as much as other mulches, allowing water to more easily reach the soil. Its sponge-like consistency helps retain the moisture, and it can benefit acid-loving plants. Pine bark nuggets are light and can wash away during heavy rain, particularly if you use them on slopes. Cedar has pleasant fragrance. It lasts longer than other organic mulches and acts as a deterrent to insects, especially when fresh. Cedar mulch can come from either the whole cedar tree or just the bark. Cypress also offers a nice fragrance. It can deter insects and fungus and effectively retains water. Because of its light weight, cypress mulch can wash away, so it does not work well on sloped areas. Redwood has an attractive color and a woodsy aroma. It resists rot and can deter insects. Redwood mulch is generally available as shredded material or in chunks. Eucalyptus has a scent that’s appealing to humans but not to many insects and pests. It comes from plantation-grown trees and some varieties can be harvested three or four times in a 25-year period. Hemlock is a product of the nonpoisonous hemlock tree — an evergreen native to North America and eastern Asia — rather than the hemlock plant. Hemlock is acidic, so it’s best for use around acid-loving plants. Pine needles — also called pine straw — come in bales, which makes them relatively easy to transport and spread. The needles tend to interweave, helping keep the material in place. 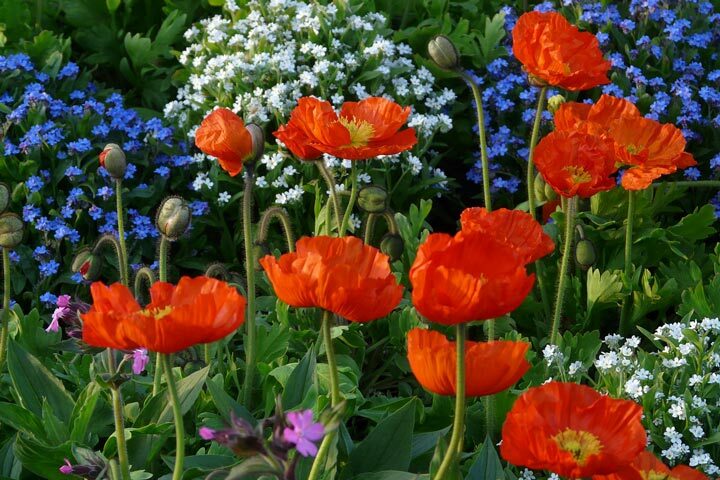 They’re long-lasting and work well in large, naturally landscaped areas. Pine needles are also a good choice for use on acid-loving plants. Straw — the stem portion of harvested grain — also comes in bales. Its light weight makes it easy to transport, but a challenge to spread evenly, since the wind can blow it away. Straw decomposes quickly, so you need to replace it more often than other mulches. It lacks the pleasing appearance of other mulches and is not a top choice for landscaping, but weed-free straw makes a good cover for newly seeded lawn areas. It’s also good for winter protection of perennials, strawberries and small plants. Compost is one of the best mulches for providing organic matter to the soil, and is highly suitable for use around flowers and vegetables. However, this rich medium provides good growing conditions for weeds. If appearance is important, use it as a soil amendment, and find a more visually pleasing material as a cover. Tip: Heavy rain can wash some mulch away, especially on slopes. Consider using shredded wood, which knits together, helping the mulch stay in place. Inorganic mulches are often man made and don’t degrade. They effectively reduce weeds and retain moisture with minimal need for replacement, but they don’t provide any nutritional benefits to the soil. These mulches — especially the lighter shades — reflect heat upward. This heat can be harmful to some plants. Be careful to keep brick and stone pieces out of the lawn, where they can become mowing hazards. 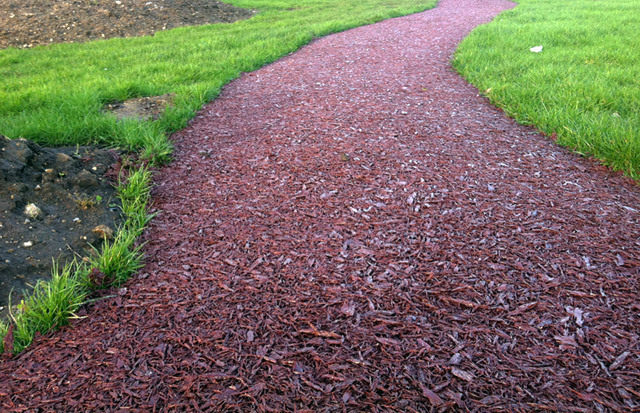 Recycled rubber mulch is a natural-looking alternative to bark or stone. 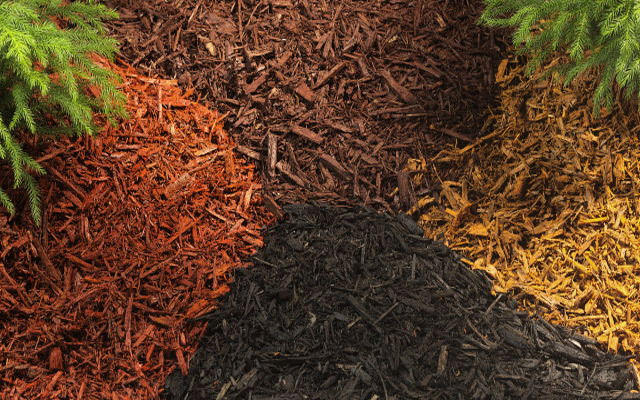 Rubber mulch is available in natural shades to provide the look of shredded wood or wood nuggets, and it’s less likely than wood mulch to blow or float away. Plastic sheeting prevents air and water from reaching the soil — you must provide moisture to plants with an irrigation system underneath the material or by hand watering. Plastic is available in black or transparent sheeting. Black material blocks light, while transparent material allows light through and can allow weeds to germinate and grow under the surface. Plastic traps in warmth and moisture but can overheat the plants’ roots or retain too much moisture, particularly if it’s covered with a layer of organic mulch. If you use plastic on slopes, material placed on top can easily wash away. You need to secure plastic to the ground to keep it in place. Landscape fabric —also known as geotextile — comes in rolls. Unlike plastic, it allows air and moisture to enter the soil and reach plant roots. It’s good for long-term use, but be sure to remove any weeds that grow on top of it as soon as you see them. The roots can become enmeshed in the fabric, making removal difficult. Like plastic, landscape fabric must be secured to the ground.